The WISE Women Project (Working to Improve through Self Employment) at Happehatchee Center is helping local women and families learn many important skills. The Southwest Florida Community Foundation’s Women’s Legacy Fund provided a grant for the year-long WISE Women Project’s course, with support from the GRACE Project (Guatemalan Rural Adult and Children’s Education) directed by Dr. Genelle Grant. 32 Spanish-speaking women participated in the project over the last year. Classes have taken place in Spanish at Happehatchee Center three times a month, and as part of the grant, we provide free transportation, childcare, snacks and learning materials. The WISE women learn about neighborhood resources, sewing, embroidery, and cake decoration, home budgeting and business, self-help healing techniques, yoga and relaxation, reproductive health, peaceful family communication, and parenting skills. To support the women’s self-employment, the WISE Women Project provides the skills orientation, materials, and tools needed to enable each woman to earn money on her own and to navigate the area for access to community resources. In June, over one hundred people attended the Family Day – Domingo para Familias, at the Happehatchee Center on Corkscrew Road in Estero, to celebrate the Working to Improve through Self Employment (WISE) Women’s Project. The local Maya Marimba band Q’anjobalita Jolom Konob played traditional Guatemalan music, children learned about canoe safety on the Estero River, and free refreshments and books were provided for all families. 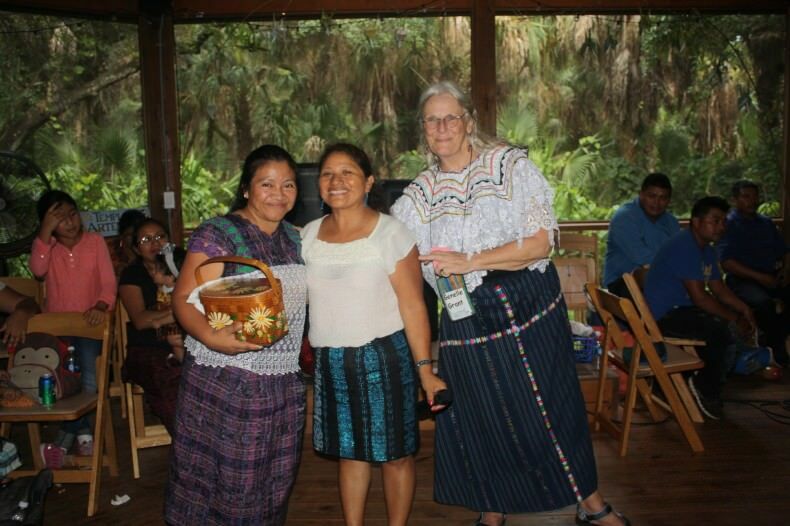 The local Spanish-speaking mothers who have participated in the WISE Women Project displayed and sold their sewing and embroidery work, and many received awards for their excellent skills and learning. I spoke with one woman in the WISE Women Project, Clara, a mother of two from Guatemala. She said she is overjoyed to be part of this program and has learned so much about small business planning, reproductive health, sewing and community resources. Clara and other women from the program had sewn fabric flowers proudly on display. She said, “along with the sewing skills we have learned how to decorate with the feminine touch and this makes us feel more feminine.” This program has completely boosted their self-confidence and empowered them to sell their own work and feel proud of themselves. Clara’s daughter was running around in an adorable dress that she had sewn for her. She is now able to make alterations and hem clothing as a potential source of income. Clara has begun to sell her work out of her home utilizing educational tools she has received during the WISE Women project at the Happehatchee Center. She has also been able to share her experience and connect with woman who are in a similar situation and find strength through education. During this program new friendships have been made through shared experiences and education. At the upcoming Family Day in November, the WISE Women Project will give new Singer sewing machines to the twelve (12) women who have attended the classes faithfully over the past year. These women will use the machines to create products to sell in the Cooperative. In addition, they now know how to sew adjustments, hems, zippers, and buttons and are able to make their own patterns. They will be able to provide tailoring and alterations on clothing, and are set to earn income in their homes.